Can we measure the popularity of the monarchy and of the Queen by representations on stage and screen? From the coronation to the crown, Professor Kate Williams investigates. 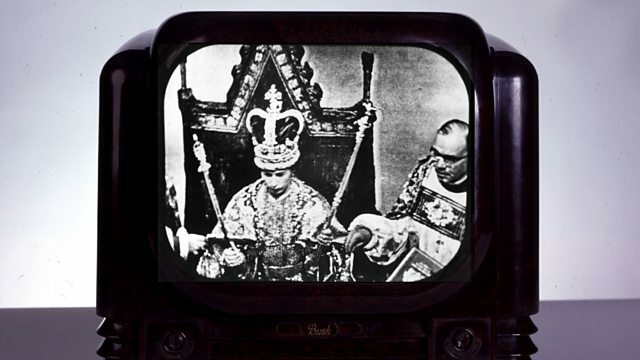 Professor Kate Williams chronicles the appearances of the Queen on stage and screen from the Coronation to the latest series of The Crown. In what way do these representations offer a guide to the Queen's popularity and public attitudes towards the monarchy? Queen Elizabeth II is one of the most famous people in the land, but also one of the most the most private and unknowable. This combination is a challenge for writers wishing the dramatise the life and times of Her Majesty. The programme is studded with archive - from the feature film of the Coronation , narrated with pomp and circumstance by Sir Laurence Olivier, through theatrical plays such as Handbagged and The Audience, to television dramas such as Walking the Dogs in which Emma Thompson played the Queen as she confronted an intruder into her bedroom in Buckingham Palace. Naturally, we hear from Helen Mirren who has come to identify closely with the Queen ("When I see her picture, I think 'Oh, there I am' or There's my girl'") and Claire Foy who recently received a Golden Globe for her role in The Crown. And we go on set of The Crown to speak to William Conacher, dialect coach, who regularly trains actors in how to "speak Queen".